WHEN THE NIGHT COMES DOWN now available! When the Night Comes Down, the new horror / dark fantasy anthology from Dark Arts Books is now available. Order a copy today! This is Dark Arts Books’ sixth release since Candy in the Dumpster debuted at the World Horror Convention in 2006. 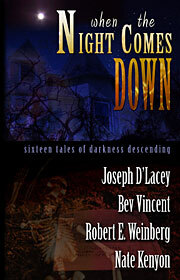 When The Night Comes Down features 16 short stories by Joseph D’Lacey, Bev Vincent, Robert E. Weinberg and Nate Kenyon, and the book will be celebrated with a launch party at the 2010 World Horror Convention in Brighton, England on March 26th. Within the pages of When The Night Comes Down, you’ll find shapeshifters and gravediggers, but also supernatural private detectives and — perhaps most terrifying of all — beautiful creatures that prey on… horror writers. Murder, death — and things worse than death — are all waiting for you inside. Bev Vincent, already renowned for his non-fiction guides to the work of Stephen King, shows off some impressive range in his fiction — from hard-edged horror (”Silvery Moon”) to Bradbury-esque whimsical (”Something in Store”) to knowing humor (”Knock ‘em Dead”). And rising young gun Nate Kenyon, in gritty stories like “Gravedigger” and “The Buzz of A Thousand Wings,” showcases why he has earned all those raves for his novels The Reach and The Bone Factory. Read more about this amazing collection here.